Party at sea? Relax on a nice yacht with a great glass of wine? Celebrate a special occasion? Why not do it on a boat. 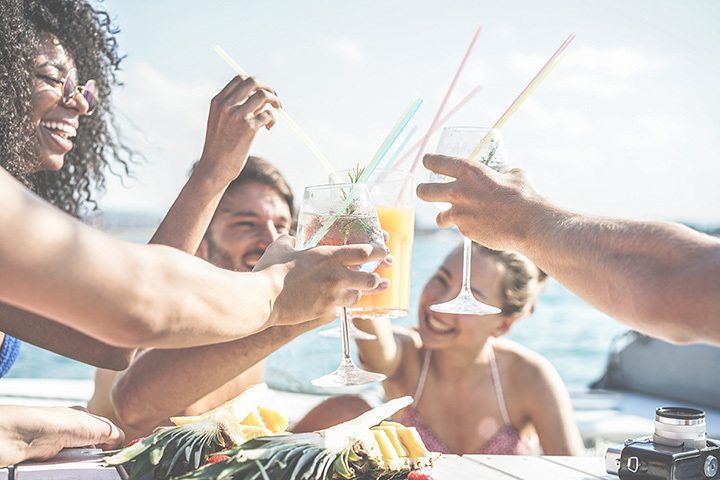 California’s coast and lakes are filled with opportunities to go for a booze cruise, the perfect way to enjoy a milestone occasion like a bachelor or bachelorette party or just enjoy having time off from the everyday grind. Check out the best booze cruises in California! The Tiki Mermaid takes pride in being a new and unique party venue for the Los Angeles area. Set sail from Marina del Rey and let the capable crew do the planning while you kick back and relax. The Tiki Mermaid is available for parties and bar mitzvahs and more. The Hornblower cruise line can be found in many of California’s bays. It makes an elegant place to hold a party, whether it’s a summer soiree, elite cocktail affair or any other occasion, including weddings. It can also just be a great date night. Whale watching or themed events, Condor Express does it all. When Condor Express isn’t giving tours of local wildlife or hosting a Blues night, you can charter the Condor Express for a private party, whether you just want to hang out with a group of friends or get married at sea. If you’re over 21, then take a Pier Pressure Party Cruise around San Diego Bay. Amazing views, lots of music, dancing, and booze are all primed for a floating club scene. Parties can be private or enjoy one of the cruise line’s special events. The classic looking yacht sails around the Bay, offering views of infamous Alcatraz Island, around Angel Island National Park and the cities of Sausalito and Tiburon. You can frequently find coupons and special offers making the cruises more affordable and easier on the wallet. The Blue & Gold Fleet offers sightseeing tours as well as special events but you can also book it for your private party. Blue & Gold offers everything you need for a cocktail party at sea or opt for a champagne brunch. You’re sure to have a good time when the drinks are flowing the driving is taken care of. Lake Tahoe’s Party Boat is available for any and all parties. You can even get a special deal if you party midweek during the summer. Get married by the boat’s captain, or just enjoy a bachelor’s party before the big day. Whether you’re throwing a party or a low-key wine and cheese event, you can count on the Party Boat to make it a good time all around. FantaSea Yachts hosts weddings, corporate events, cocktail parties and birthdays and other celebrations. Prices are customized according to your specific needs but with almost 40 years in the biz, it’s pretty certain that FantaSea Knows how to party. One of the most popular ways to celebrate in the OC is onboard a yacht. Cruise Newport Beach offers yacht cruises for parties of all kinds, from birthday bashes to retirement celebrations. You can also join Cruise Newport Beach for their nightly cruises around the harbor or their entertainment cruises with live music showcasing various local performers.